With the Youngstown State University football team coming off a Football Championship Subdivision quarterfinal victory against Wofford College in double overtime, YSU will look to knock off another top team in the FCS. This will be just the second time that these teams have met. The last meeting was a YSU victory in the 1-AA (FCS) playoffs in 1997, 25-14 on the road. YSU won the national championship that year. YSU will look to knock off the second best team in the playoffs. No. 2 Eastern Washington University comes into this game on an 11-game win streak. 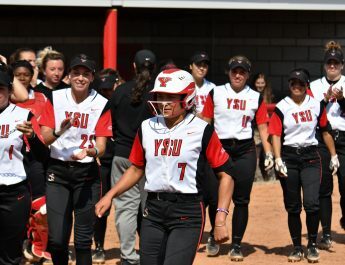 YSU is currently on a five-game win streak. 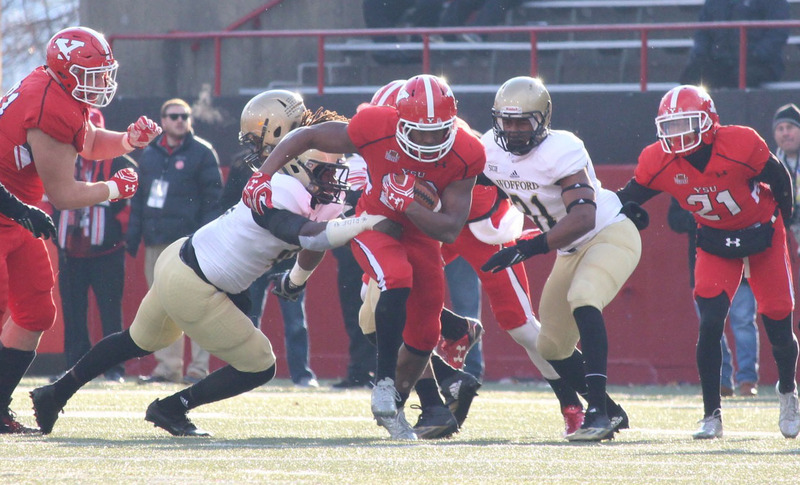 Youngstown State University running back Tevin McCaster breaks a tackle during YSU’s 30-23 win over Wofford College in the quarterfinals. Dellovade also said that because EWU has three receivers that have gained 1,000 yards each, they will have to play close attention to those guys and keep up with them. EWU wide receiver Cooper Kupp, who is the FCS all-time leading receiver, is the best wide receiver YSU has faced in a long time. Kupp has 1,520 yards and 16 touchdowns this season. YSU left tackle Justin Spencer said the Penguins have a challenge ahead. He said a win over Eastern Washington would get YSU won step closer to its goal of winning a national championship. 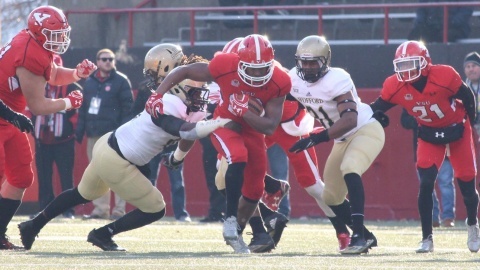 YSU has been efficient on offense, especially in the playoffs. The Penguins are averaging 36 points per game and averaging 454.7 yards per game in three games so far. Defensively, YSU has been impressive this season. The Penguins give up just 18.1 points per game and just 313.5 yards per game. In the playoffs, the defense has gotten help from the offense as they have given up 23.6 points per game and 383.3 yards per game. Spencer said that even with all those numbers and the way they have played; they try not to talk amongst themselves about the progress of the team. Eastern Washington’s defense has also only given up 14 points in two games in the playoffs. Pelini also said that EWU quarterback Gabe Gubrud is very good along with the three wide receivers. Gubrud leads the FCS with 4,807 yards passing and leads the FCS with 5,365 yards of total offense (412.7 yards per game). He is also second in the nation with 45 passing touchdowns. On Tuesday, Eastern Washington was compared to South Dakota State. Both the Eagles and the Jackrabbits runs spread offenses, both have mobile quarterbacks and both have some of the best receivers in the FCS. Wofford only threw three passes in last week’s matchup with YSU. Pelini said the Penguins are going “from one extreme to the other.” EWU throws the ball at an average of 45 attempts per game. Pelini also began his press conference by addressing rumors that several players would be suspended for the game following failed drug tests. Pelini said he would hold all players responsible for their actions, but would not identify the players. YSU will travel to Cheney, Washington to take on the Eagles at 6:30 on Dec 17.